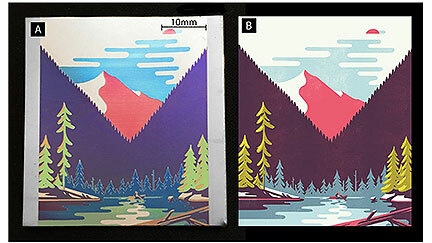 A new single laser method can create colorful artwork on metal by altering how much heat is applied to the material’s surface. 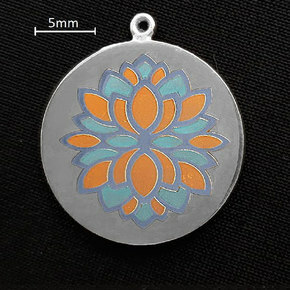 Typically, creating color on metal requires different types of lasers, which involves a number of lasers and very specific settings. To simplify the process—and commercialize the technology—a team from ITMO University developed a way to alter the laser’s processing parameters to produce color on metal in three different ways. One method, laser oxidation, can be used to create a thin oxide film that will generate color by light interference. This can be used over a wide surface area. A second method relies on subwavelength nanoparticles formed by the laser that create color in ambient light via surface plasmon resonance. Changing the shape of the nanoparticles will change the color, and this process is most useful on precious metals. The final method involves using the laser to melt a pattern of grooves that will scatter light to create an image only viewable at a specific angle—useful for creating anti-counterfeit tags.